For the dynasty which ruled Saurashta, Gujarat, see Saindhava. In the epic Mahābhārata, Jayadratha (Sanskrit: जयद्रथ) was the king of Sindhu Kingdom. He was married to Dushala, the only sister of the 100 Kaurava brothers. Besides Dussala, he had another two wives, one from Gandhara and the other from Kamboja. He was the son of the king Vridhakshatra. He was killed by Arjuna with the help of Krishna. One day, during the time the Pandavas were in exile, the Pandavas needed to gather samitha and darbha (holy grass) for rituals and to gather food. They left Draupadi alone at the ashrama and requested Sage Trunabindu to watch over her. On that day Jayadratha saw Draupadi and sent his minister Kotikasya and asked him to inquire as to who she was. Kotikasya went over to her and after learning about her identity, informed Jayadratha that she is Draupadi, the wife of the Pandavas. Jayadratha in spite of learning her identity, went to Draupadi and proposed to marry her. Initially welcoming him as their Pandavas brother-in-law, Draupadi vehemently refused the proposal. Infuriated, Jayadratha abducted Draupadi and started moving towards his kingdom. The Pandavas returned to their ashrama to find Draupadi missing and learnt about the event that had unfolded by the account of Draupadi's friend Dhaatreyika, who had witnessed Jayadratha forcefully carrying Draupadi away. Yudhishthira then ordered Arjuna and Bhima to rescue Draupadi. Both of them defeated Jayadratha and brought him before Yudhishthira. Draupadi begged for Jayadratha to be pardoned and not killed, in order to prevent Dushala from becoming a widow. She suggested that he be treated like a slave. So, Bhima shaved Jayadratha's head leaving him with just five spots of hair on his head, before setting him free. Abhimanyu fights the Kauravas in the chakrayudha (left); while Jayadratha on the elephant on the right prevents the Pandavas from aiding Abhimanyu. After his humiliation at the hands of Pandavas, Jayadratha gives control of his kingdom to his wife and goes into severe penance towards lord Shiva. When Shiva appears before him and grants him one boon, Jayadratha asks for the power to defeat and kill anyone in the world. But lord Shiva refuses , saying that the combination of Krishna and Arjuna cannot be defeated. Still unchanged, Jayadratha asks for a boon that will allow him to fight, defeat and hold at bay anyone in the world except for the combination of Krishna and Arjuna, on one specific day of his choice. Lord shiva grants him this request and disappears. Jayadratha returns to ruling his kingdom and waiting for that one day. 2 years later, naturally, Jayadratha fights on the side of his brother-in-law Duryodhana in the Kurukshetra War. On the 1st day of the Mahabharata war, in the noon he defeated King Drupada, but spares him. On the 13th day of the Mahabharata war, when the chakravyuha is launched by Dronacharya, Jayadratha makes use of Lord Shiva's boon. 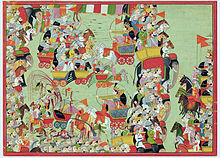 Arjuna's son Abhimanyu manages to enter the formation; he intends for the Pandava forces to follow after him and smash the formation from the inside. Jayadratha moves to close the gap, and is able to hold all of the Pandava brothers and their forces at bay. As part of Drona's strategy, Arjuna and Krishna are busy battling Susharma and the Trigata Army elsewhere. Abhimanyu, who does not know how to exit from the chakravyuha, is trapped and brutally killed by the Kaurava Warriors in a combined attack. The Pandavas are startled after finding that Jayadratha was able to hold the world's most powerful warriors at bay. In particular, Draupadi, Yudhishthira, and Bhima feel very guilty for not killing Jayadratha when they did have the chance. Arjuna blames Jayadratha to be the cause for Abhimanyu's death. He vows to kill him the very next day before sunset, failing which Arjuna would kill himself by jumping in a pyre of fire. This sets the stage for the epic 14th day of battle. Dronacharya arranges a combination of 3 vyuhas in order to protect Jayadratha from Arjuna. Bhima, Satyaki and Arjuna tear through the Kaurava army. But it was clear that Arjuna couldn't accomplish the goal before the sunset. At a climactic moment, with the sun nearly set and thousands of warriors still between Arjuna and Jayadratha, Krishna sends his Sudarshana Chakra in order to mask the sun and create an illusion of sunset. The Kaurava warriors rejoice over Arjuna's defeat and look forward for his imminent suicide. Jayadratha was hiding behind Duryodhana, relieved that he was saved. Therefore, he came out of the formation. Suddenly the sun was free from the eclipse and Krishna tells Arjuna, pointing at the sun that the sun had not set, but it was only a solar eclipse. He then pointed at the hiding Jayadratha, telling Arjuna to sever his head. He then tells Arjuna to shoot the head into the lap of Jayadratha's father. Arjuna then quickly picked up his Gandiva and shot a Pashupatastra at Jayadratha. Jayadratha's head than flew away very far and landed on lap of his father, Vridhakshatra. His father, being a sage had granted him a boon that whosoever will be responsible for his son's severed head to fall onto the ground will have his head burst into 100 pieces. Therefore, when his father, horrified at having his son's head in his lap, hurriedly got up, the severed head fell to the ground, killing Vridhakshatra at the same moment.